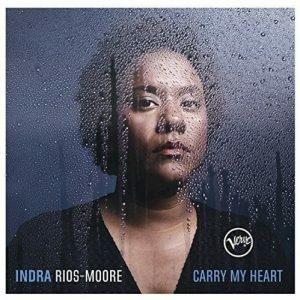 New York-born singer Indra Rios-Moore, now living in Barcelona, releases her new album “Carry My Heart” this week on Verve. It comes right after her pretty successful (at least in Europe) “Heartland” album. One of the most sympathetic features of the album is the fact that Indra wanted to record an optimistic record because there was (and is) simply too much whining going on. Not that most of the current matters aren’t disheartening, but it feels good to be warmed and eased by Indra’s warm and caressing voice on covers such as “I Can See Clearly Now” or Curtis Mayfield’s “Keep On Pushin'”. Still, you can file this one under “protest” albums, too because during the writing process, a certain Drumpf took over the White House. But in a recent interview with her, she just won’t let such a mess bring her down and she gladly took her role as an artist and performer seriously and cries out against it. And the warmth and beauty of her personality is ardently echoed on the eleven tracks of the disc. The very subdued, intimate and soothing album opens with the Gospel-like title track (about all the people fleeing their home countries and heading for Europe) and features her longtime Danish group members which also recorded with her on the last album: her husband saxophonist Benjamin Traerup, bassist Thomas Sejthen, drummer Knuth Finsrud and guitarist Samuel Hallkvist. They just beautifully gel on all the cuts and turn Steely Dan‘s “Any Major Dude” (“When the demon is at your door /In the morning it won’t be there no more”) into a healing little anthem. The harmonization on the other original tune, “Give It Your Best”, is simply beautiful, with saxophone and guitar blending perfectly and Indra’s almost preaching voice is forceful, yet sensitive and striking. Pop singer Robyn‘s “Be Mine” is much more intense and stronger than the original and even though her head voice shines through here and there, she is very convincing and captivating on interpreting the golden soul classics: “Don’t Say Goodnight (It’s Time For Love)” by The Isley Brothers is a very welcome treat. She captures the beauty and the essence of the song wholeheartedly. We also get two jazz standards: “Love Walked In” by George & Ira Gershwin is done pretty straight-up with Indra’s voice shining bright and strong. And Duke Ellington‘s “Come Sunday” is of course a very special, difficult song to sing and everybody has his favorite interpretation. There is just no chance to top Abbey Lincoln’s recording on her 1959 “Abbey Is Blue” LP.